Saturday was a busy day for Salina Animal Services. First, their Clear the Shelter event was a huge success, with all of the available dogs finding furever homes within the first 45 minutes or so. By the end of the third hour of the four-hour event, most of the available cats also had homes. 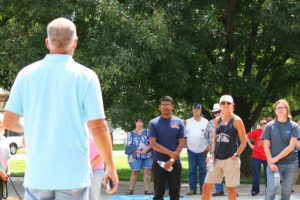 Then, at 1 p.m., approximately 40 people gathered at the animal shelter, 329 N. Second, to show their support for the animal services program, its employees, and its manager, Vanessa Cowie, who was placed on administrative leave and escorted from the shelter on Wednesday. Former Salina Mayor Jon Blanchard welcomed those attending the rally. Blanchard talked a bit about why the group had gathered and asked how many people planned to attend the city commission meeting on Monday. A number of people raised their hands. In April, the Saline County Sheriff’s Office, with the help of Salina Animal Services, seized 189 animals from property in the 5000 block of Country Club Road. Deputies arrested Beverly Fullen, 66, and Matthew Fullen, 40, both of Salina on numerous charges that included 165 misdemeanor counts and four felony counts of cruelty to animals. The Fullens have asked that the charges be dismissed, claiming in part that the deputies did not have the expertise to determine the condition of the animals, nor did they consult with a veterinarian or other livestock expert. The Fullens also cited what they called inaccurate and inflammatory remarks made about them by Salina City Commissioner Melissa Rose Hodges on her official Facebook page. The case is now working its way through the Saline County District Court system. On June 26, District Judge Rene Young signed an adjudication for interim care of the animals until the court case is resolved. The Fullens and their attorney agreed to the interim care. What may be affecting the Cowie situation is the amount of money that the city spent in caring for the animals prior to the interim care agreement. Blanchard told the group gathered Saturday that as the court case plays out, “a lot more things will come to light” concerning Cowie being placed on administrative leave. Former Salina Mayor Aaron Householter reminded those who planned to attend and speak at the city commission meeting on Monday that they weren’t necessarily at odds with the commissioners. “A lot of times we agreed with what they were saying, but our position sometimes didn’t allow us to say so,” Householter said of he and Blanchard’s time on the city commission. “I’m sure they’re probably pet owners as well and they may very well love Vanessa and the animal shelter as much as we all do,” he added. Both Blanchard and Householter agreed. “That’s a great point,” Blanchard said. “That room (the room in which the city commission meets) is your room. That room isn’t the room of the five people who sit behind the desk. It is the room of the people they face. The city commission is scheduled to meet at 4 p.m. Monday in room 107 of the City-County Building, 300 W. Ash.